The Fellowship was fortunate enough to obtain a copy of ARCHIE VS. PREDATOR #1 Dark Horse Comics. The story is written by Alex de Campi, with pencils by Fernando Ruiz, inks by Rich Koslowski, colors by Jason Millet and letters by John Workman. Yeah, this shouldn’t work, but stranger things have happened. 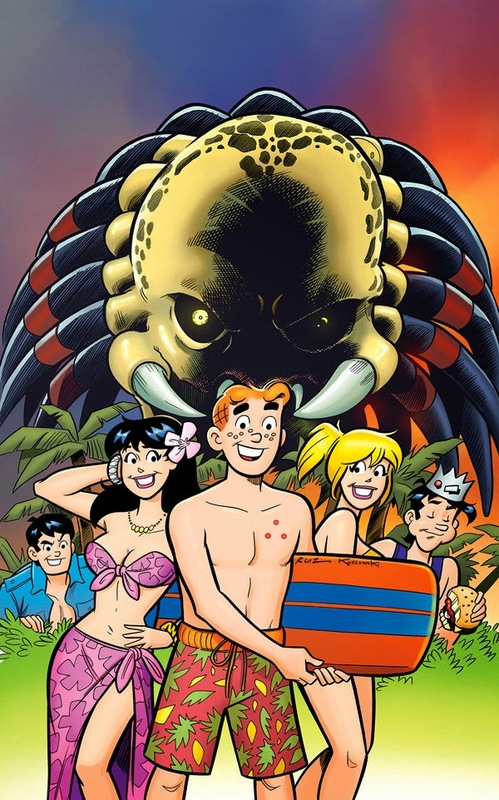 Alex de Campi completely captures the voices of the Riverdale gang, while building the suspense that’s a trademark of the Predator films. I can't wait to see Fernando Ruiz's version of the Predator. Also, there is a one page strip where Sabrina meets Hellboy. Very cute. Archie Comics has made some bold moves in recent years, and as long as they are backed up with great storytelling I’m for it. From what I’ve seen so far, we have a winner here. ARCHIE VS. PREDATOR #1 is in stores April 15th, or available for ordering at www.darkhorse.com.